Newswatch: Is Brexit killing off Britain's high streets? This week both Maplin and Toys R Us went into administration putting more than 5,000 jobs in jeopardy [BBC / BBC]. It wasn't the only bad news for February. 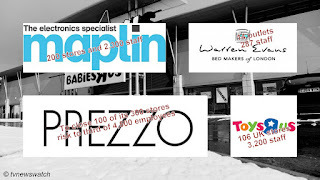 On the same day Prezzo, the Italian restaurant chain, announced it was to close 100 of its 300 branches risking a third of its 4,500 employees [BBC]. And earlier in the month the bed maker Warren Evans became another victim as it too went into administration putting 300 jobs at risk [City AM]. Supermarket chains have also made cutbacks. In early February Morrisons announced it was to axe 1,500 jobs in middle management [BBC]. Meanwhile January saw Sainsbury announcing it was to shed thousands of shop floor jobs as part of a major shake-up at the firm [BBC]. Tesco too said it was cutting some 1,400 staff [BBC / Guardian]. January also saw Marks & Spencer put some 500 jobs at risk as it announced the closure of 14 outlets [Guardian]. All these major chains said some jobs would be reabsorbed in other roles, but there would undoubtedly be some redundancies given the continuing trend to make cutbacks. Statistically the rate of retail store closures less than seen in 2010 according to Consultancy website. However, while closures may not be occurring at the same rate there is a growing trend to make cutbacks. And there are still some worrying signs that Brexit is having a marked effect on the high street. There is growing uncertainty in the retail sector and some firms have specifically cited Brexit as a having a causal link to their cutbacks and closures. Maplin's CEO blamed "sterling devaluation post-Brexit, a weak consumer environment and the withdrawal of credit insurance" for the firm's demise [Retail-Week]. It is nearly a year after Theresa May invoked article 50 and some 20 months after the EU referendum. And the weak pound and the general uncertainty concerning Britain's future trading position is affecting investment and future planning. After a grim December, many retailers had been hoping for a bounceback, but the figures have showed that consumers were not as hardy as they once were and the retail sector is facing a long-term, continuing slowdown. Shoppers are being hit by declining real wages, record levels of consumer debt and the prospect of higher borrowing costs [City AM]. Meanwhile a weak pound has resulted in higher costs for importers and retailers. Indeed, rising cost of imports such as food and fuel since Brexit vote is pushing prices to rise at faster rate than anywhere in G7 according to the OECD [Guardian]. With inflation running at 3.1%, Brexit is squeezing living standards. Bread is 5.3% more expensive than this time last year, whilst the price of butter is up by over 21%. Fresh fish is up over 11%, whilst coffee is over 10% more expensive. Overall, on average, food and non-alcoholic drink prices have risen by 4.2% over the last 12 months. And with job uncertainty and wage stagnation, consumer confidence is dropping. In turn this leads to retailers rethinking their future. Some are making cutbacks and shedding jobs. But others have been forced out of business. It is easy to point to the advent of the Internet and the effects of online shopping as having causal a causal link to the closure of the likes of Toys R Us or Maplin. But there are other factors that have created problems for physical stores. In a healthy economy where consumers have the spare cash to buy, real world outlets have fewer issues. A small markup on price is not such a big deal for consumers who like to browse bookstores, record stores, fashion retailers and toy shops. But in a cash-strapped society consumers will be far more savvy. Physical stores face bigger overheads than online retailers. Employee numbers are often higher, and may often be higher paid than online retailers. Bricks and mortar stores also face higher business rates especially in town where they also face further issues concerning increased problems of parking. Consumers often complain at the ability to park easily in town centres as well as the cost of parking and over-zealous parking wardens. Brexit may not be the cause of the demise of Britain's high streets. However it may well be the straw that breaks the camel's back.